I love authentic Mexican food, and let me tell you, it isn’t easy to find out here in New England. There have been some glimmers of hope, but overall it’s one of the main cuisines missing from my diet and my heart. So lately, I’ve been resorting to making it from scratch. While I have to say that I wouldn’t deem my take on Mexican as authentic, it has the right flavors and ingredient combinations. Ryan has been on the road for about a week now, so I invited my friend Hayley over for these Chicken and White Bean Tostadas. After you bake the chicken in the oven, they come together in just a few minutes. Skip some steps and buy pre-made salsa and guacamole; I prefer the chipotle pico de gallo from Whole Foods and Wholly Guacamole, which is found in most grocery stores. Combine the garlic powder through cumin in a small bowl. Use the spice mix to season both sides of the chicken breasts. Also season well with salt and pepper. Place the chicken breasts in a medium-sized pyrex pan that is sprayed lightly with cooking spray. Add the diced tomatoes, sliced onion, and white beans, spreading evenly around the pan. Cover with foil and bake for 40 minutes. Just before the chicken is to come out of the oven, brush the tortillas on both sides with a little olive oil. Place them in the oven on a cookie sheet or right on the oven racks, and bake for 4-5 minutes or until they are crispy. Remove the chicken and tortillas from the oven. Let the chicken cool slightly so that it retains its moisture when you slice it. You can either slice the chicken into bite-sized pieces (as I have in the picture) or shred it with two forks for pulled chicken if you prefer. To assemble the tostadas, place one crispy tortilla on each plate. 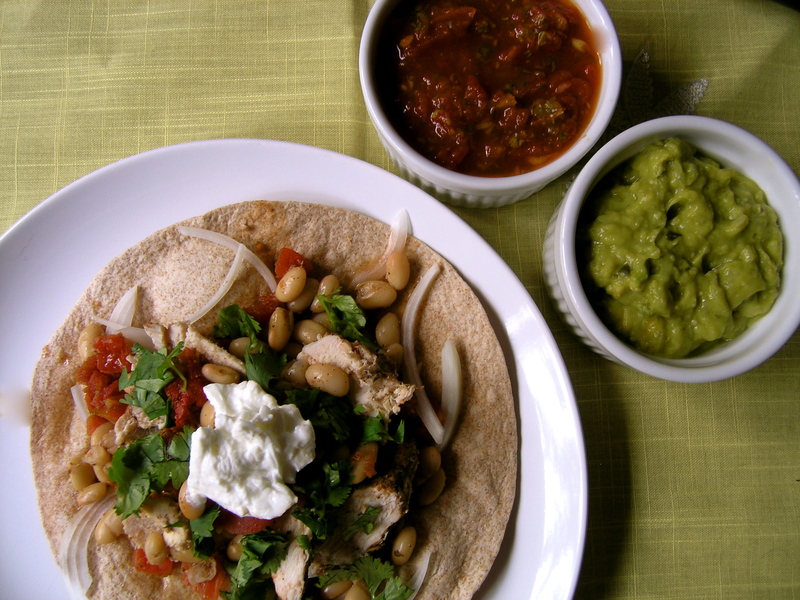 Divide the sliced or pulled chicken, white beans, and tomatoes among the four plates. Top with a little dollop of Greek yogurt and some fresh cilantro to serve. Place the guacamole and salsa in small containers to serve along side.